Now is an exciting time to be part of the Naval Helicopter Community! NHA is your member-based non-profit organization open to anyone interested vertical lift aviation. Our membership is mainly comprised of active duty and retired USN, USMC, and USCG helicopter pilots, aircrew, and maintenance professionals. 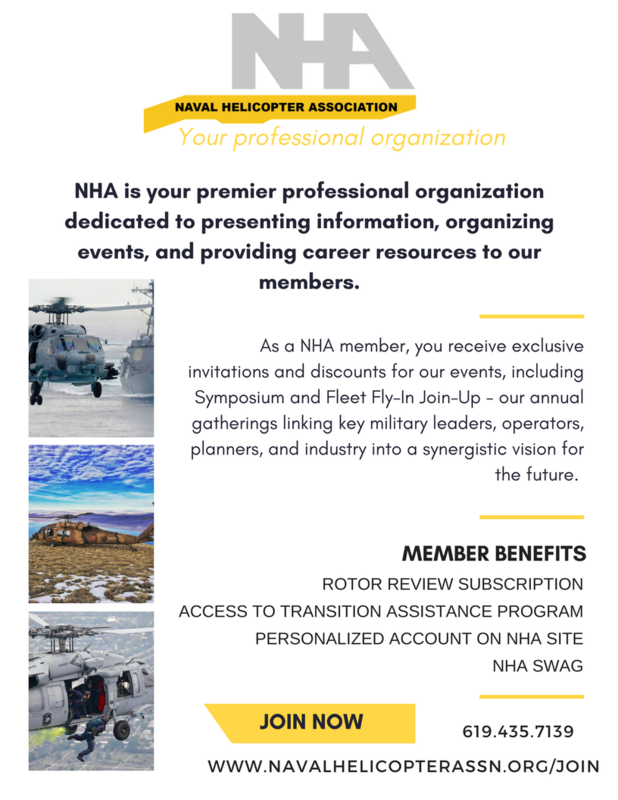 As the fastest growing community of Naval Aviation, with nearly ½ of naval air assets directly related to rotary wing, NHA is the premier professional organization dedicated to presenting information, organizing community social events, and providing career resources to our members. NHA Provides professional and social functions in each region, with exclusive access to the annual events Symposium and Join Up. NHA Symposium is an annual gathering linking key Military leaders, operators, planners and industry into a synergistic vision of the future. Each year, we sponsor multiple individual, crew, and corporate awards for excellence in rotary wing aviation and maintenance. NHA also offers scholarships to undergraduate and graduate students. Please contact the NHA National Office at 619.435.7139 or [email protected] to receive your Nugget Membership Discount!! NHA members have access to both national and regional events including the annual Symposium and Gulf Coast Fleet Fly-In/Join Up. Members receive discounted admission and access to online preregistration.